When you were in school what do you remember learning the most? Chances are if you went to school over twenty years ago or more then you remember that handwriting was a way of life. Now in classrooms across the country you will see that computers and technology have taken over. Cursive handwriting is making a come back in school. However, there are many people out there now that are disputing the fact that technology should not be the only way to teach students communication. In fact, there are arguments that handwriting especially cursive will help people read old documents. This is increasingly true for funding documents of our country and written law. Would you find cursive’s comeback a hindrance or joy? The use of cursive handwriting has decreased with the use of technology. 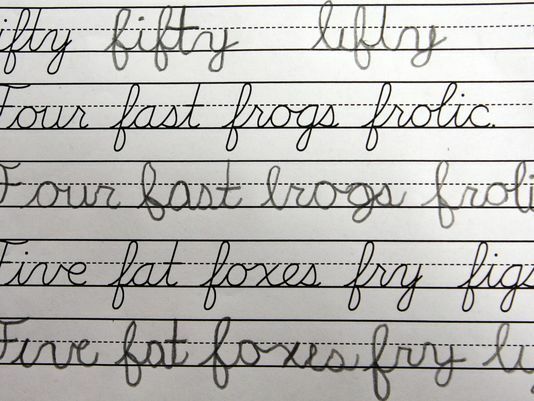 Now, cursive handwriting might be headed for a comeback in schools in the state of Illinois. Real life use of cursive handwriting can be seen in reading notes or letters and even in the signing of forms.